Set The Alarm, Get More Done. Max Weight 110 lbs (50 kgs). 0.25 oz (0.01 kg) Resolution. Full Numeric Keypad for Fast Operation. Strong Magnetic Back on Handle. The new SRS1 refrigerant scale is big enough to comfortably fit a canister, but compact and light weight enough to carry easily. It has the ruggedness needed for HVACR, with thick aluminum walls to maintain accuracy, and rubber feet and rubber pad to soften the impact of daily use. You can quickly set a charge or recovery alarm using the big numeric keypad without scrolling digits. Once you dial in how much refrigerant to charge or recover you can keep working, knowing the alarm will sound when it’s close to the time to close the valve. Weighing less than seven pounds, and housed in a heavy duty soft-sided case, the SRS1 is easy to throw over your shoulder when you need to carry other things or climb a ladder. 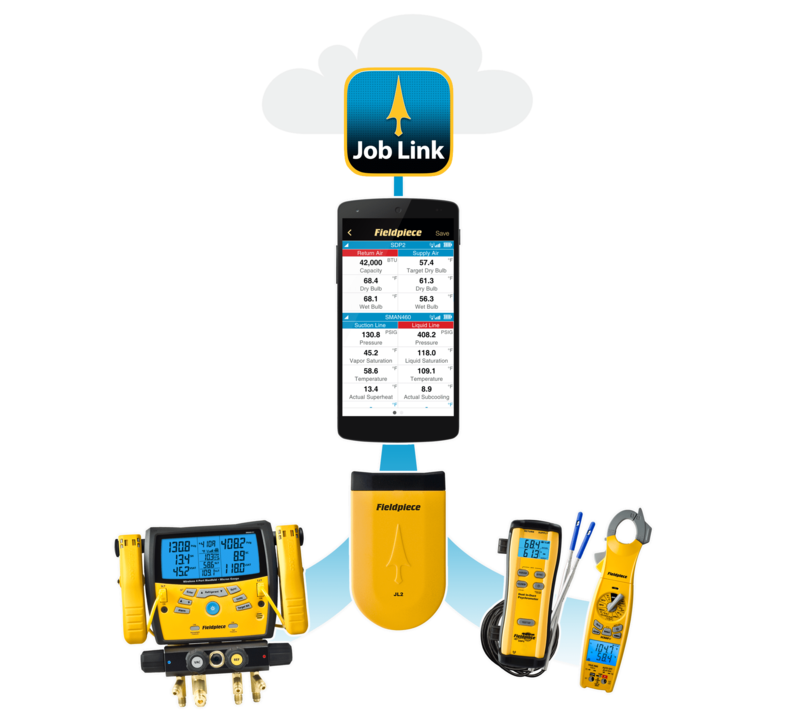 We now have the Fieldpiece Job Link Transmitter in stock. 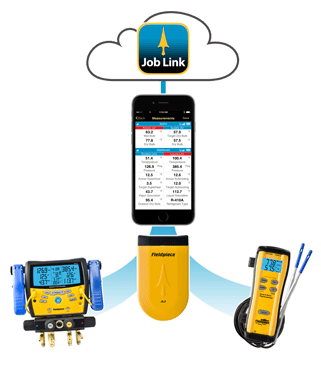 The JL2 enables users to run jobs through Apple and Android mobile devices by wirelessly connecting the mobile device to Fieldpiece devices such as the SMAN4, SMAN440, SMAN460, and SDP2. 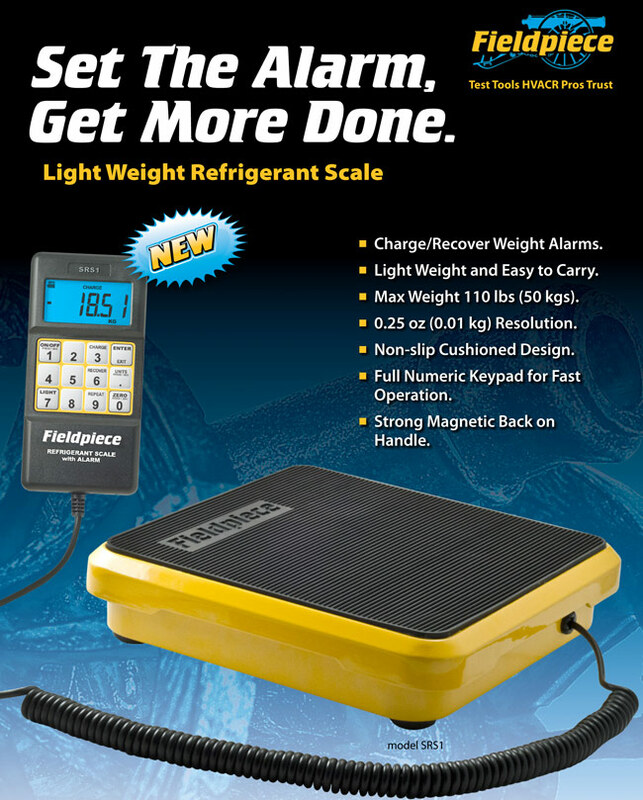 The SRS2C is the HVAC/R industry’s first Wireless Refrigerant Scale. No more tangled cord mess. No more being attached to the platform. It gets even better. The platform is constructed of solid aluminum with rubber bumpers, has a sloped edge and rubber diamond plate to hold canisters in place and the remote stores in the platform when not in use. Technicians who have one first tell us how cool they think it is, and, more than a few have told us it’s the best in HVAC/R. Rubber bumpers and diamond plate platform. Push button sync and zeroing.